What Exactly Is A Barter Exchange? And how do they work? Bartering is a billion dollar industry and growing. Barter Exchanges are an intricate part of that business. Knowing what they are and how you can benefit from them can be critical to an overall strategy. Back in pre-money times, businesses operated in a barter economy, where goods and services were exchanged freely, and money was not a medium of exchange. Those days have passed, but many business people still barter..
A modern way of bartering involves, of course, the internet and organizations that manage and control bartering between businesses and individuals. These systems are called barter exchanges. How Big is the Barter Economy? The International Reciprocal Trade Association (IRTA) says it’s difficult to tell, because most barter transactions don’t get recorded. But the IRTA says barter is in the 12 to 14 billion dollar range. About half of this amount comes from traditional retail barter exchange companies and corporate barter. What is Barter? How Do Businesses Barter? Keeping track of barter transactions gets complicated if you are bartering with several individuals or businesses. This is where a barter exchange comes in. Barter is simply an exchange of goods and services between individuals, including businesses. The important thing to remember about bartering with other businesses is that the IRS considers barter taxable. So you must keep a record of your barter transactions, including any expenses you have related to these transactions and the income you have from these transactions. What is a Barter Exchange? 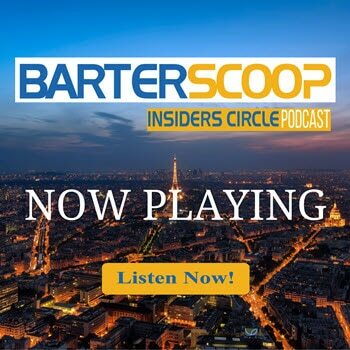 A barter exchange is an organization that serves as a third party to coordinate barter transactions between members of the organization and as a bank to keep track of the value of barter transactions and the value of each member’s account. Barter exchanges provide monthly accounting for each member and year-end tax reporting of barter transactions. Barter exchanges are usually local or regional, and they have websites which list products or services for sale. If you buy products or services from exchange members, your Trade Account is debited; if you sell products or services to other members, your account is credited. Barter exchanges allow you to trade with more businesses. Many of these barters are not one-to-one. For example, an auto repair business may barter with a radio station that barters with a printer that barters with a delivery service. Related: “Questions To Ask When Choosing A Barter Exchange”. Barter exchanges charge an initial membership fee, a transaction percentage, and a monthly maintenance fee. Some barter exchanges also charge a monthly fee to “stock” the account, to encourage buying and selling. One big advantage to a barter exchange is your ability to barter with several other businesses or individuals in a kind of round-robin system and you don’t have to worry about keeping track of who owes what to whom. Are Barter Exchanges Local or Online? Both. You can find a local barter exchange group for your local business. These groups have local events like mixers and Facebook pages so you can interact with other local businesses. Your local group may be a part of a larger online barter group, so you can barter with businesses in the U.S. and around the world. How Do Taxes Work for Barter Exchanges? Record keeping. Exchanges serve as the bookkeeper for barter transactions, which is helpful to the members. Exchanges use their own trade dollars, to bank (keep) money for businesses that don’t have an immediate place to spend it. For example, let’s say someone wants to barter with you for your consulting services. You can bank the barter dollars you receive, but you don’t have to spend them immediately. If later you find you need a website done, you can use the barter dollars you earned earlier. Tax Reporting. At the end of each year, the barter service provides a record of the fair market value of all income you received from transactions, on a Form 1099-B. You will need to keep track of expenses related to your bartering transactions, to use them in your business tax return to offset barter income you have received. 3 Things to Spend Your Barter or Trade Dollars on! Blown Out Tire Barter To The Rescue! more with our exclusive newsletter. Leave Your Home And Barter In Europe! Anything is possible with Bartering!